NEW VIDEO! Watch Pia help me make this delicious pancake that are as tasty for breakfast as they are for dinner or cocktail snacks! Wow. It’s hot guys. Like really hot! We are cooking literally and figuratively! But the good news about this roasting hot sun is what it is doing for my herb and vegetable garden. You know what looooves sun? Tomatoes! And ours are finally ripening up beautifully which means we have to use them up as soon as they are done to make room for more tomatoes! And the zucchini are cranking and the basil is thriving- which can only mean one thing! 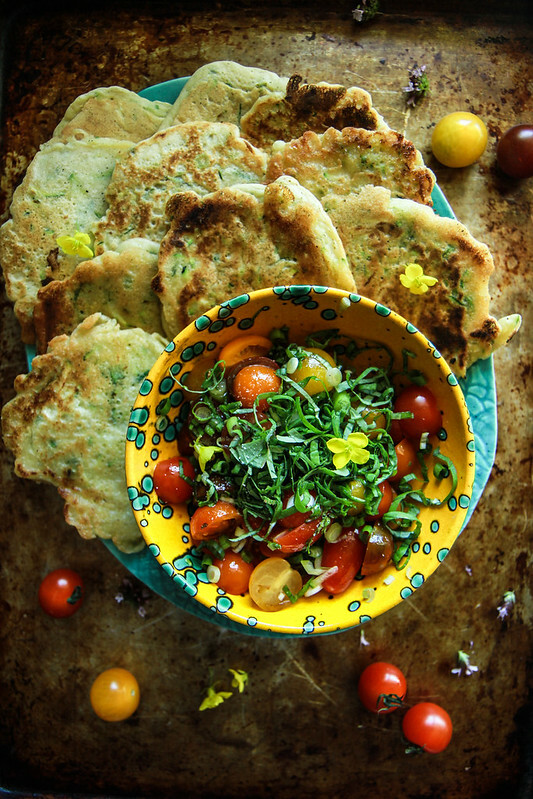 Zucchini Basil Pancakes with Bruschetta Topping! This happens to be Pia’s very favorite breakfast recipe (which is why Pia really wanted to help me with this video!) and she often loves to add avocado wedges or lox to the mix too. OH. MY. GOODNESS. They are seriously absolutely awesome. It’s almost like a little taco pancake! I loved the bruschetta topping with the pancakes, but the girls have also been requesting them instead of Gluten Free bread to dip in their soup, or to bring cold to school in their lunch like they are flatbread. When a 6 and 9 year old start requesting them regularly, you know they are good! For the Bruschetta Topping mix together the cherry tomatoes, basil, green onions, olive oil and vinegar. Season to taste with kosher salt and set aside. Mix together the coconut milk and vinegar and set aside. In a large bowl, whisk all of the dry ingredients together until they are well combined. Add the coconut milk to the dry ingredients along with the melted coconut oil and whisk everything together until smooth. Then stir in the zucchini, basil and the green onions. Heat a griddle or non-stick pan over medium-high heat and grease the griddle with coconut or vegetable oil. Spoon the pancake batter and cook for about 1 minute or until you see little bubbles forming on the edges of the pancakes. Flip them over and cook another minute. Serve the pancakes hot with the bruschetta topping. 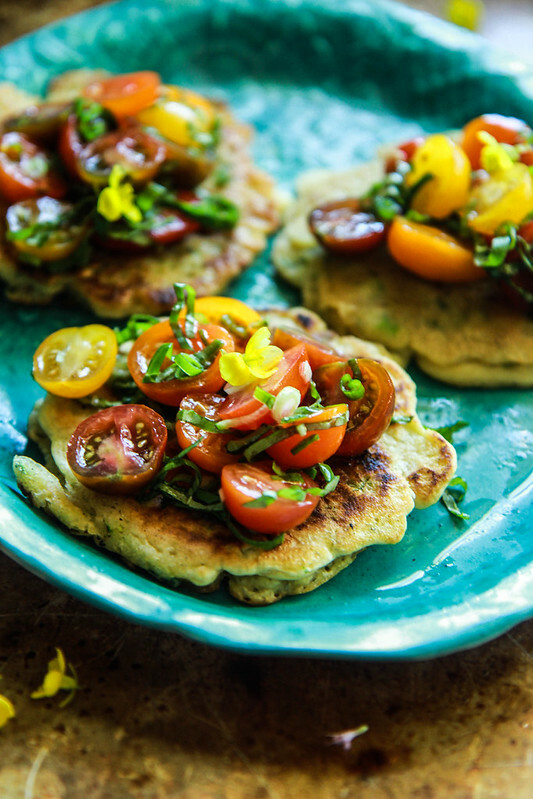 I love these savory cakes! but would not make the recipe again. Hi Gina- what kind of coconut milk did you use? that may have affected the taste? I use coconut milk from a carton in the refrigerator section which is mild- canned coconut is way more coconutty. You could also substitute almond milk or another non-dairy milk. Just made these for dinner and this is an excellent recipe! The bruschetta topping made the dish. Thanks for always coming up with the best ideas, Heather! I’m so into these! Need to try ’em, stat. 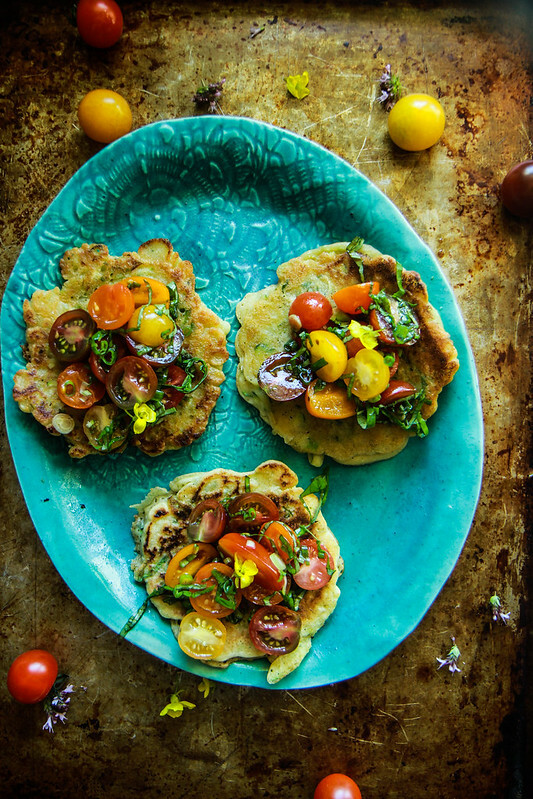 Will this recipe for zucchini pancakes work with almond milk instead of coconut milk? Just tried your recipe for lunch today! I altered the recipe to what I had on hand. My flour mix was cassava flour-almond flour and tapioca starch. I only had canned coconut milk so I did half coconut and half almond milk. They were a tiny thick but seriously yummy! I’m loving exploring your recipes and finding inspiration for this very new journey to being vegetarian. The tomato mix was great too! Thanks!! Watching how you make Zavory Zucchini Pancake, I didn’t see you mix coconut oil in your batter bet your recipe asking for coconut oil. I had been dying to try this recipe and tonight I finally got the chance. These are extremely flavorful and oh so satisfying. If I had known they would be so delicious I would have doubled the batch. Thank you Heather and Pia! Yay Linda!!! thank you so much! These pancakes are perfection. I’ve made them about four times already and the whole family loved them! My 23-old twins also look forward to gobbling these down and I couldn’t be happier about that. I got the refrigerated coconut milk specifically for this recipe and I’m glad I did. No coconut flavour at all. Thank you so much Irma! Very happy to hear that this has worked well for you! I’ve made these pancakes so many times that I’ve lost count. I’ve been adding finely sliced spinach and Swiss chard or kale to these too. The kids don’t even notice and gobble them up. Made them once without basil and just a warning to any attempters – basil is key to this pancake recipe!